Are you trying to come up with ideas for the perfect Christmas family trip? If you are feeling adventurous, we suggest you take your loved ones to the northernmost Finnish region to visit Santa Claus at his workplace. Aside from having the opportunity to hand your letter over to the staff at the official post office in person and have your picture taken with Joulupukki himself, this themed village located in the capital city of Lapland in Finland (Rovaniemi) has plenty in store for lovers of the festive season and so it stays open for visitors all year round, although its grand opening and main activities take place at the end of November, just in time for the much anticipated countdown to the magical days. How can I get to Santa Claus house in Lapland, Finland? 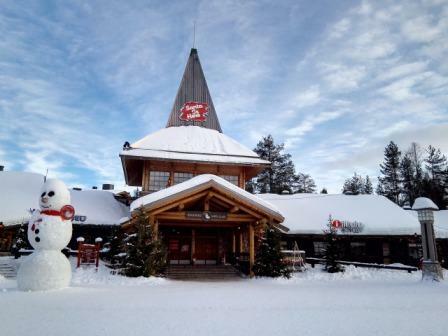 The easiest and fastest way to get to Santa Claus Village implies catching a flight from Helsinki airport in Finland to Rovaniemi airport in the capital city of Lapland. Internationally renowned airline companies like Norwegian Air Shuttle and Finnair operate direct flights to Rovaniemi, their fares ranging from 70 to 124 euros per passenger. Once you have arrived, you may take a taxi or walk for about 20 minutes to reach the Santa Claus office from the airport, or commute by bus if you are staying in Rovaniemi’s city centre. In the latter case, either Santa’s Express Bus or the local bus line 8 will take you to the themed village and back to your hotel. To skip this commute and make the most of your trip, we advise you to choose accommodation close to Santa Claus Village in Finland, since there are different types of lodging available in the vicinity and it will be easy to find the ideal place to stay for you and your travel companions. Read below for inspiration. Only five minutes away from Rovaniemi airport and conveniently situated within Santa Claus Holiday Village in Finland, these cabins successfully cater to the needs of travellers from all over the world by providing them with free parking spaces, spacious and cosy family units, private terrace and sauna, en suite bathroom, TV, heating and complimentary WiFi network. A daily buffet breakfast is served and shuttle services to and from the airport can be booked. Make a reservation to stay in one of these comfortable cabins in Lapland suitable to accommodate up to four people (two adults and two children) and enjoy additional benefits that will enhance your adventure in the form of reindeer and husky sledding, snow bike tours, boat trips, ski and fishing activities. What is more, you and your travel buddies will get the chance to indulge in the most delicious traditional Finnish specialties and coffee at the onsite Christmas House Restaurant. During your trip to Rovaniemi, you may also choose to sleep in a resort within short walking distance of the house of Santa Claus in Lapland and a short drive away from the airport (pick-up and drop-off services are available upon request). In line with other accommodation options in the area, it offers daily hot breakfast, hot tubs, saunas, cosy family units, in-room TV, kitchenette and living area, but the reason why this resort in Santa Claus Village is becoming popular among travellers is that they frequently get the opportunity to watch the Northern Lights from its privileged location, especially between the months of October and March. After visiting the post office and taking a picture with Santa Claus, we recommend that you enjoy some quality time in your private Jacuzzi, have a comforting meal at the onsite restaurant or purchase souvenirs from the gift shop. Should you prefer a more conventional hotel stay, know that the Nova Skyland Hotel stands roughly 3 minutes away from the village on foot, and offers fully equipped apartment-style rooms and villas, as well as a daily varied breakfast buffet for guests. Each unit of this hotel close to Santa Claus Village in Finland features free WiFi, flat-screen TV, bathroom, private sauna, cosy beds, private kitchen and terrace with views. Even large groups are welcome and can stay together in the same space here; by way of example, a couple with two children may reserve a suite with forest views (which sleeps four), while families of up to eight members may book a villa with views including king-size beds and sofa beds. The onsite restaurant not only serves breakfast but also lunch, dinner, brunch, snacks, coffee and tea and alcoholic drinks. Will you be making a stopover in Helsinki on your way back home? Then you might consider staying in a hotel in central Helsinki and spend a few days exploring the capital city of Finland.